It remains a mystery to me why adults who have young children are very focused on keeping them out of harm’s way and yet, when it comes to the companion animals in their life, their safety is often regarded in a different light. Indoors is generally believed to be a safer environment than the outdoors, but there are still areas of concern that need to be considered. Human food waste, medications, indoor plants, are just some examples. Canines are usually highly food-motivated and if anything edible is within reach, they are unlikely to resist the temptation. They also love to chew (and swallow) stuff, especially when they are ignored or left alone for extended periods, and get into mischief when they happen to be bored. Felines are naturally curious and find weird hiding places. Many are attracted to feathers and tinsel as well as plants and flowers, and nibbling any part of them must definitely be discouraged. Chew, rip open and possibly ingest: these consequences can cause intestinal obstruction; if whatever it is cannot be removed by inducing vomiting or elimination via the rear end, surgery may be necessary. A seasonal note: Given the chance, some cats will play havoc with Christmas trees and decorations, so be prepared! 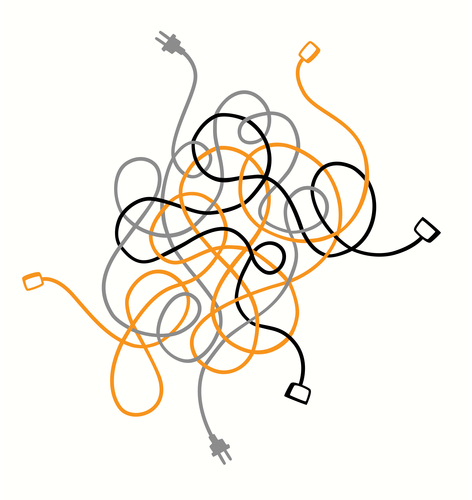 Chew: electrical cords: they can cause a fatal electrical shock. Eat: indoor plants and flowers in a vase: cats seem to be attracted to them but some are toxic. It is estimated that one in every three pets will go missing at some point in their lifetime and less than 20% of dogs and 2% of cats will ever be reunited with their human family. Most owners of a new puppy, kitten, adult dog or adult cat will go to their local pet supply store and use the engraving machine to put their pet’s name and a contact phone number on the blank I.D. tag they have just purchased. That, of course, is a good first step, but I would ask the following…does your pet wear its collar and tag all the time and by that I mean all the time it is outdoors AND all the time it is indoors? The practice of microchipping pets has seen a significant surge in recent years because of one indisputable fact. Pet parents now know that they have a far better chance of finding their pet if it has a chip than if they had solely relied on one or even two visible I.D. tags. Collars may get pulled off and tags can become detached. 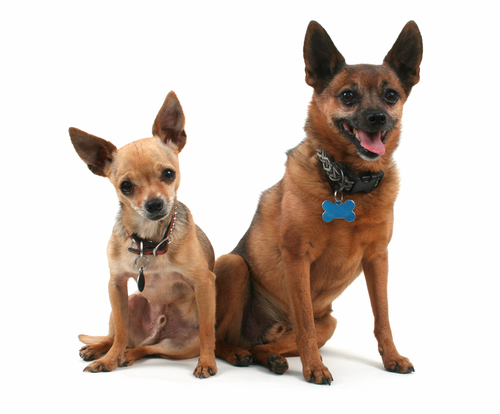 Remember, microchip databases can be accessed 24 hours a day, every day of the year. Also, it is usually possible to have a pet scanned at any time by going to an animal hospital during regular office hours or an emergency animal clinic at night-time, weekends and on holidays. Very obvious but often forgotten, it is important to keep all the I.D. information updated, particularly after moving to a new address and, of course, when any other detail has changed. STUFF HAPPENS – Simply said: do the right thing and protect your pet using BOTH a visible I.D AND a microchip I.D. More on this topic —and there is plenty more, such as the new, super hi-tech I.D. — some other day. Simply said, without water there is no life! We and our companion animals need it to stay alive. Water is a vital commodity that regulates body temperature, transports nutrients via the bloodstream, eliminates waste and toxins, supports the organs (which includes the skin) and assists in every single one of the body’s complex functions. Animals in the wild obtain most of the water they need to maintain their basic body functions from the different kind of foods that they eat. For carnivores, this comes from their prey. Likewise, the dogs and cats that share our lives should be hydrated to a large extent by the food we give them but very often they are not. A diet of dark meat, chicken and fish has an abundance of moisture whereas it is obviously lacking in dry food. Most dogs should drink between half an ounce and 1 ounce of water per pound of body weight daily. 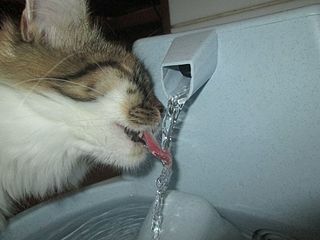 A cat of average size and weight will need between 5 and 10 ounces of water per day. KITTIES ARE A LITTLE DIFFERENT. BUT WHO KNEW! When they are thirsty enough, kitties will drink from a water bowl. However, they much prefer the constant trickle of this vital liquid when it comes from a pet water fountain, as you can well see from the photo. This is definitely one of my major pet peeves. and, 99% of the time, handlers are clueless of the risks involved when they are used to go walkies. Any leash that has a reach of around 30 feet is not meant to be used for regular dog walking and certainly not where there is traffic, however light. Nevertheless, a retractable leash can be a good tool for obedience training in a wide open space. The spring mechanism can malfunction; either not extend or not retract. 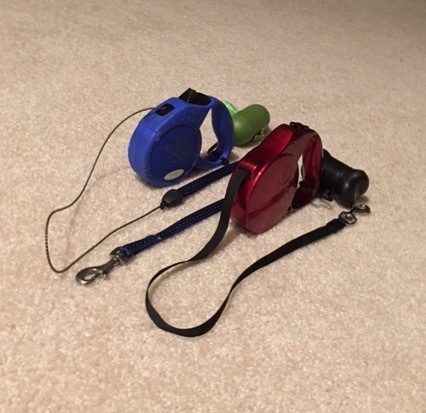 If the thin cord or the flat nylon strip snaps, you have a dog on the loose and the leash can boomerang back to hit the person holding the plastic handle. If any part of the leash gets wrapped around the human’s leg, it can cause burns or cuts. Also, the dog, as well as other dogs, may be at risk of injury if they become entangled. Another harmful scenario is when the human suddenly stops the leash from extending, or when it is allowed to spool out totally and the moving canine is suddenly stopped in its tracks. Neck wounds and throat injuries as well as damage to the spine are frequently the result. In my experience, 99% of retractable leash dog walkers are clueless risk takers. Here are some examples to ponder. A dog that has not be trained to walk correctly will pull because it knows it will always be given more leeway. The plastic case is bulky, you bend over to pick up his business, you fumble, you drop the leash… it’s dragged along the ground and makes a noise which scares the dog as it runs faster to get away from the noise, traumatized. You are still distracted, you are still talking on your phone, but this time your dog is walking 12 feet behind you, you have no idea what he’s up to.